Graphic Design course should deal with the most common topics in the most commercial sphere of advertising and graphic design branch. Hopefully, students will learn how to approach different requests in graphic design and how to make successful visual communication. To me visual communication-in architecture and graphic design-has often been about the challenge of paradoxes; aesthetics vs. functionality or minimalism vs. chaos, and still visual communication is the most transcendental thing I’ve stumbled upon in life. It’s a constant excuse to stay curious, learn something new and to interact with and observe society, media and people in general. And somewhere in between that I focus on the details, the process and keeping it simple. Sketching and drawing - The most significant part of designing anything in graphics industry. Students do not need to be skilled in drawing, this part should teach them how to work with the beginning ideas. They will learn about design elements such as colour, line, shape, space, texture. 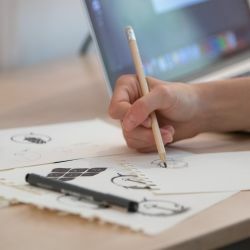 Logo design - The part where ideas gets it's form and become the actual design for companies, services, or products, considering the importance of logo design in the visual image of a company. Typography - Students needs to know how to work with texts, fonts and basic principles of typography - it effects and even psychology used via typo to clients, selection of proper fonts with Corporate Identities or product designs. They are also exposed to technical and aesthetic issues and communicative abilities of typography as individual forms and as text. Corporate identity - A brand is expressed in a system of tangible items that fuel the recognition of that brand. These items will typically have a strong identity that separates them or makes them stand out from the crowd of brands on the market. This part should connect all the exercises together to make a functional identity of a company (there will be a selection of various kinds of businesses). Final state will contain brand manual. The course is ideal for beginners, employers, entrepreneurs as well as people in their designing skills. Based on the past experience half of the students have a strong passion for design however didn't get a chance yet to create anything touchable so far. The other half are students already immersed in designed with decent drawing and illustration skills but no significant digital graphics skills. The main focus is on Adobe Illustrator and Adobe Photoshop.